So for all of you out there trying to tell me that there are some outrageous vanilla, fruit or other flavored cakes that are on par with chocolate, you may as well check out now. We weren’t really meant to be friends. It was a rather short relationship anyways so there’s no hard feelings on my part. Feel free to move along to the next blog on your to do list…one that does not have a chocolate crazed maniac as its author. At this point, I feel compelled to explain to you that my life as a foodie was not my own choosing…it almost happened in utero if you will. My dad is the true foodie of our family who just let me ride shotgun on the food loving escapade I call my childhood. Every year since I could remember, my dad would eagerly await the annual Los Angeles Magazine’s top 100 eats issue. This was before the Food Network ever existed. There was no “Best of..”, or “Diners, Drive-ins and Dives.” This was way before it was hip to like food so much. There was just our trusty LA Mag and their food critics, who would give us our food road map that we set out to tackle over the course of the year (not all 100 though, we weren’t THAT insane). We ended up at “Aunt Kizzy’s Back Porch” in Marina Del Rey where we ate the world’s best homestyle Mac n’ Cheese–no truffle oil, or lobster–just cheesy noodle magic. Then there was “Pie and Burger” where, you guessed it, they had the best pie and burgers. There is a long list of these ma’ and pa’ style places where we ate the best something or other. This cake is one of those something or others. 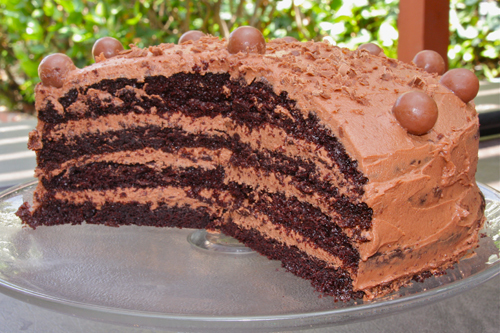 As luck would have it, this chocolate malt cake was baked by a restaurant in our own lovely downtown Burbank, and every now and then, when we would have a midnight hankering for chocolate cake perfection, my dad would run down there and get a slice to go. A slice would suffice for the whole family because it was BIG AND RICH AND A CALORIC MONSTER! We are actually fairly health conscious if you can believe it. I know, you’ve read my blogs, and frankly you did not fall off the turnip truck and were not born yesterday…you don’t believe it. But that’s OK…you don’t have to…I won’t hold it against you…only your opinion on chocolate is important to me–and, hm, well, no that’s it. Important note: Do NOT make this same day for an event unless you start in the morning. The cake is fairly easy but the frosting requires at least two hours of refrigeration before spreading it on the cake! Prepare your two round 9 or 8 inch baking pans by spreading a pat of butter all over the bottom and sides of each pan. Then drop a tablespoon of flour in each pan and tap the flour all over the pan, sideways and upside down at the end (over the sink) to remove excess flour. IMPORTANT: Make sure there are NO ungreased, unfloured spots on your pan. If there are, add a little more butter and flour on those spots. Heat your oven to 325 degrees. In a stand mixer or mixing bowl, combine oil, buttermilk, yolks, and vanilla. Beat 2 minutes with a paddle attachment or with a hand mixer at medium speed. In another bowl, sift together (or use a wire whisk like I do to avoid sifting) sugar, flour cocoa, baking soda and salt. With mixer on LOW speed, add one third of the sifted dry ingredients to oil mixture and beat until blended. Then add one third of the hot water and slowly combine these (you don’t want the hot water to splatter on you…ouch!). Continue this process, scraping down the bowl often until all ingredients have been add and mixed. Pour equal amounts of batter into the two greased cake pans. Bake at 325 for 35 minutes, testing the cake for doneness (clean toothpick and cake should be springy when you lightly touch it). Cool in pans on racks 15 minutes then transfer to a wire rack, remove cakes and cool completely. Wrap each layer in plastic wrap and FREEZE until your are ready to assemble. This will help you cut it into four layers later. It will be firmer and easier to cut. This will make an ample amount of frosting with some left over. I think it’s better to have too much frosting at the end of frosting a cake then just a bit too little (was my case in the one pictured above…therefore I increased the recipe by a half for ampleness). 1 box of Whoppers candy for garnish. See above picture. 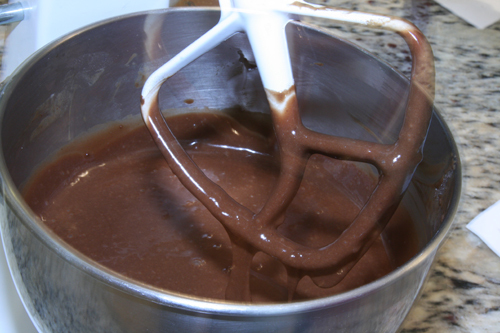 Melt the chocolate in the top of a double boiler. In a stand mixer or mixing bowl, with a wire whip, combine malt powder and cold cream. Whip on high speed until stiff but not dry. Transfer to another bowl, cover and place in the refrigerator while you do the next steps. In a mixer bowl with a paddle attachment, put sugar, cream cheese and vanilla. Beat on high speed until creamy, about 1 minute and scrape bowl. Add melted chocolate to cheese mixture and beat 1 minute on medium speed. Remove bowl of malt cream mixture from fridge and add 1/2 of the mixture to the mixing bowl. Beat on medium speed until it is incorporated Fold in the remaining whipped cream until the mixture is a uniform color. Transfer the mixture to another bowl, cover and refrigerate at least 2 hours. Carefully slice each layer of cake in half to create four equal(ish…I am not an exact type of person…just do your best here). Use 1/4 of the frosting to CAREFULLY frost each layer and place one layer on top of the frosting as you go. Go ahead and use a serrated knife to level your layers so you don’t have a dome on the layers. My awesome teenage niece, Hannah, saw me struggling with this part. If you must know, I am not known for my great assembling of cakes. She told me to carefully transfer my sliced cake layer onto a plate and then turn the plate upside down over the top of the cake, lowering the cake layer and doing your best to center it perfectly on top of the bottom layer. Mine was fairly crooked as it turns out…look shocked if you don’t mind….but when I was done, I dropped the “whoppers” on the top, shaved a little extra chocolate over the whole thing and voila…it was just fine. Just look at it with your head tilted a bit..that will help. OMG, put that in a cake keeper, put on some clothes and come over here. I’ll put on the coffee and we can have a Kaffeeklatsch. I like that you felt the need to tell me to get dressed first! 😛 Maybe you do get that I am a little nuts. Would love to Kaffeeklatsch with you! Oh how I wish it wasn’t gone! this is outrageous! i can taste that rich, chocolately, moist cake in my mouth just by looking at the picture! 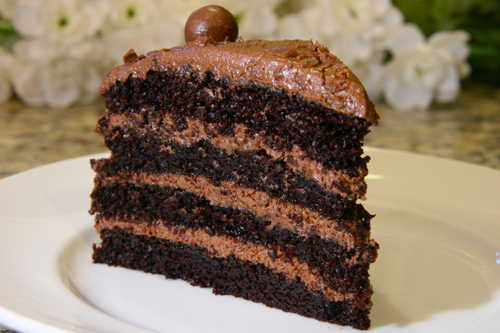 there’s nothing like that deep dark color of a chocolate cake and creammmmy frosting! You got it….nothing like chocolate! Glad we agree. Wow! Great post. thanks, the cake is fantastic! To: My baking cohort and partner in crime…Glad you Liked it Sweetie! I was the lucky one, Geni’s dad, who got to see and taste this cake. 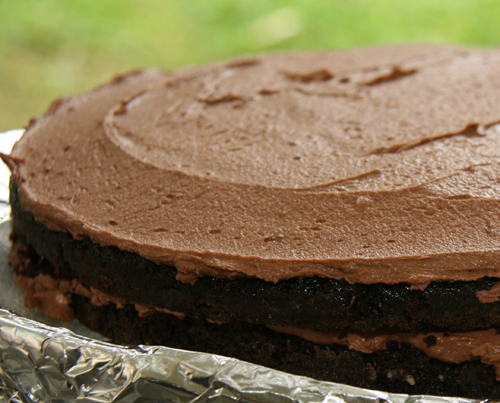 It is better than any other cake: dark, rich and moist. Wow!!!!!!!! Okay…I want to put those two comments together and…it still wouldn’t be enough. You said earlier that you have chocolate cake in the fridge, but not this good, hm great looking one! I am sure it tasted soooooo good….yum! I’m totally on the CHOCOLATE bandwagon!!!! So I guess that means we can remain friends! 😎 Looks yummy!!!!! Excellent…I really like you. I was worried there for a second. Thanks for stopping by my baking blog and leaving a comment. Your chocolate cake is driving me mad! I MUST TRY IT! lol. I will let you know how it turns out. Any dessert involving chocolate and/or cream cheese is always a huge hit with my hubby, so next time I make a dessert, this will be it! Thanks for being so detailed…very cute blog and fun to read! Hi, Geni. Now that I have read your post carefully and learned that this comes from “beautiful downtown Burbank” (you might be too young to remember “Laugh-In” on TV? ), I will have to try it -and try to compare to my memory of Nigella’s version. I wonder about adding malt powder to the cake for extra malty-ness – maybe it would be overkill? (BTW, I just bought some Horlick’s malt powder which I think is British and will have to compare Carnation and Horlick’s for their ingredients.) 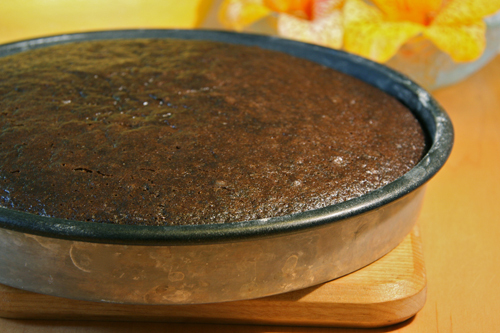 The cake is rather healthful, with its use of oil instead of butter. In fact, this cake has no butter. So it’s a “lite” dessert!!! What about the whipped cream frosting? The heavy cream and cream cheese add protein. OK, so I was kidding about this…. No, I like your version of lite better! This. Looks. Like. Heaven. I, too, have a serious chocolate addiction, though you may not guess it from my fruity-filled blog. But I just took my South of the Border spicy chocolate cupcakes out of the oven and topped them with an amazing spicy chocolate ganache. The recipe will be up later tonight–you really must try it! Will do! I will check it out tomorrow! Thanks for stopping by! Oo my goodness this looks amazing! Definitely going to have to give this recipe a try! Wow this is one gorgeous cake! Beautifully done. 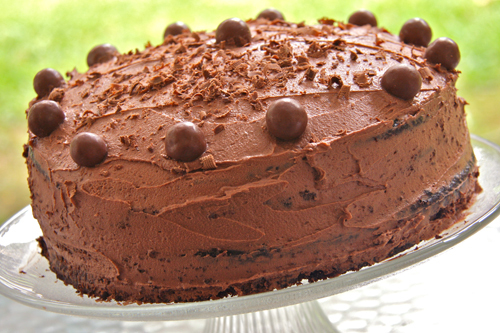 Oh moist choclate cake! just by the photos I can taste the chocolateyness 🙂 thanks for sharing this simple recipe.. well, just by reading the frosting made my waistline expand hahaha yummy! I made your cake for my birthday as my birthday present! It was WONDERFUL JUST AS I SUSPECTED!!!! Thx SO MUCH for posting it!!! Hey I would accept that cake as a present any day. Thanks for letting me know how it went. I really like to here feedback.